The Carlisle 4040505 Sparta® basting brush has a unique red bristle design that spreads liquid and sauces and can be designated for a specific task or marinade. 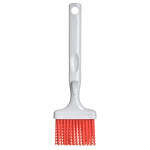 A hanging hook in the middle of the silicone handle keeps the brush from falling into pans or bowls. The brush resists odors and stains and can be used in temperatures as high as 500 degrees Fahrenheit.